As I’ve written many times here on MacStories, I’m no weather expert. I’ve used Apple’s Weather app for years, until I figured that I wanted just a little more stats and a different interface to check on forecasts and current conditions. Still, I don’t need a complex weather app with terminology I would need a dictionary for. That’s why for the past few weeks I’ve been using Check The Weather and liked its simple approach to weather data presentation. 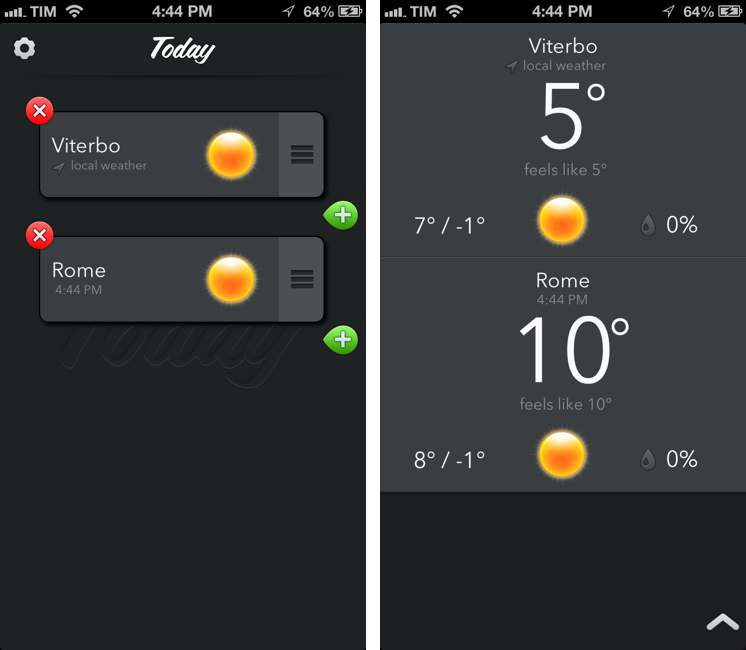 Today Weather is a new app by Savvy Apps – creators of some of our favorite iOS apps like Agenda and Buzz Contacts – that, while similar to Check The Weather on the surface, is actually more reminiscent of Agenda. 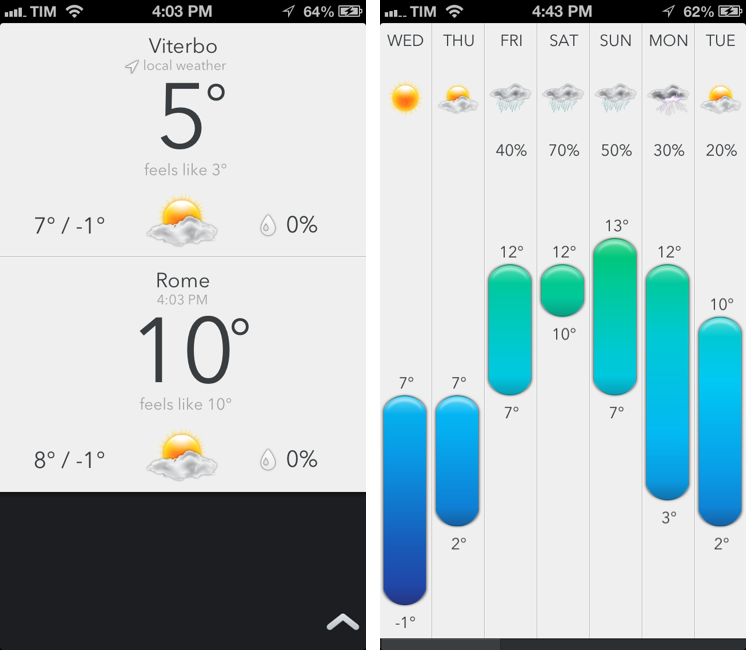 Today Weather, like Savvy Apps’ calendar client, starts from a screen providing a general overview for the future (weekly forecasts), then goes to the “now” (today’s weather), and, last, provides a detailed breakdown of the current day (hourly forecasts). This is not too dissimilar from how Agenda treated the process of switching from Month to Week to Today’s events, and it speaks to Savvy Apps’ willingness to keep a consistent model across its apps. Once you’ve added some locations, the app starts with a screen that lists all the cities you’ve configured. 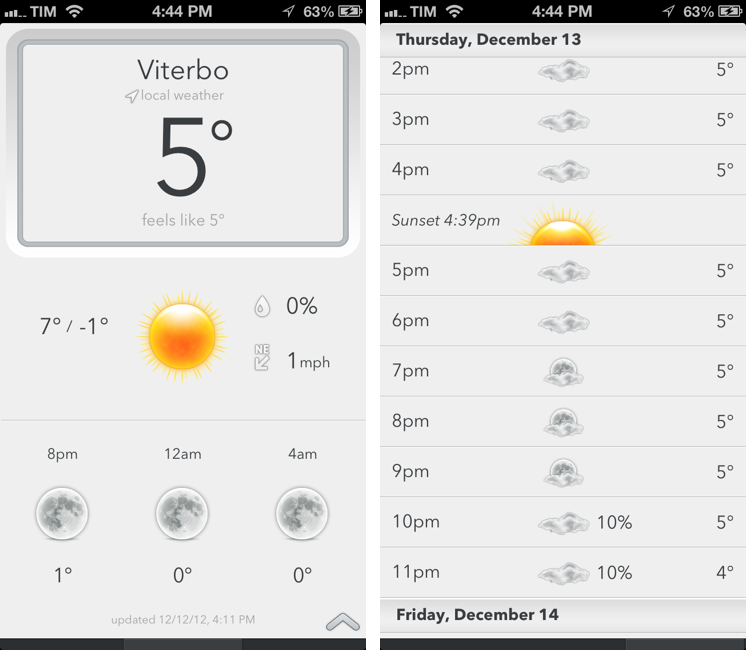 The summary screen is simple to scan (visually speaking), and immediately lists temperature (including a “feels like” variation), date, and high and low. The background of this Dashboard automatically adjust from white to black depending on sunrise and sunset times – it’s not just a “light” or “dark” theme – and the view itself is “responsive” to how many locations you add. Locations will be bigger if there are only two of them, but they’ll be smaller if you add more. As you can guess, you can tap on a location to drill down into the aptly named Location view. Before you do that, though, try to tap the little triangle icon in the bottom right corner: enabled anywhere in the app, the button lets you “go up” one level until you reach the Zoomed view, which is where you’ll manage your locations and access the Settings. The functionality of the zoom button is replicated by a traditional pinch-to-close gesture, although I prefer the button as it’s easier to reach. Location view is made of three separate screens. The one in the middle repeats the information provided in the Dashboard, adding wind speeds and a forecast for the next 12 hours organized in three separate forecasts with 4-hour blocks. The way I see it, this is the screen you want to check in the morning to immediately see what a day is going to look like. A scrollbar at the bottom suggests that you can swipe letf or right to view more data, and the omnnipresent zoom button lets you go up to the Dashboard. On the right, you’ll have the hourly forecast for the next three days including sunrise and sunset times, chance of rain, and beautifully designed weather icons. In fact, every icon in Today Weather has been crafted by Savvy Apps and it doesn’t look like any other weather app I’ve tried (I believe several of them are using the same set of commercial glyphs and icons). What I like the most about Today Weather is the screen on the left. Called Forecast view, it comes with a normal and “geek” mode to visualize temperature and weather for the next week. Unsurprisingly, I like geek mode, which is enabled by tapping on the screen: with a set of vertical bars, the graph displays high and low temperatures for the week using the NOAA color gradients. Normal mode simply displays the highest value, and you can switch between the two with a tap. In doing so you’ll notice the nice animation that brings up the bars one after the other. It’s a fantastic touch. Forecast view is the screen I’ve been checking out every day because I like to know, in simple terms, “what the next days will be like”. Today Weather provides that kind of information in three ways: data (numbers), icons, and colors. There are other features that are nicely implemented, but which I don’t use. Today Weather has a radar map for upcoming precipitation, but it only works in the US; there are in-app alerts for severe weather conditions (these work in the US and Europe), but the weather has been too nice in Viterbo for me to test them. You can swipe down from the Location view to open another location (and you can keep swiping down to add a new one), but I only added Rome to the app for screenshot purposes. Today Weather is a very polished product. Some people complain about the abundance of weather apps released in the past months, but in reality I believe competition is good for everyone because it forsters innovation. In Today Weather’s case, while the app may look similar to others (but then again, it’s the same similarity you find between Twitter clients), there are some features that I truly like. The Forecast view is the best one I’ve found to date as it works for me. The design of weather data looks great on the Retina display, and I’m a fan of Savvy Apps’ focus on gestures for navigation. Eventually you’ll have to choose a weather app to use on a daily basis. I still haven’t decided, as I’m curious to try out new ideas. However, in spite of the lack of an iPad version, I have found myself constantly coming back to Today Weather on the iPhone for its Forecast view. Of all the weather apps released every week, Today Weather is the one I recommend if you’re interested in trying a new one. It’s available at $1.99 on the App Store.